Hot Dog Machine | JOLLY JACKS JUMPING CASTLES! 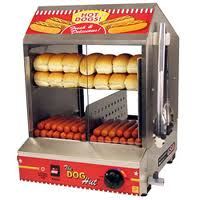 This Hot Dog Machine is for the ideal use for your party or fundraiser event. – Accommodates up to a maximum of 100 hot dogs/sausages or 42 buns. – Removable product trays and sliding doors allow for easy access to hotdogs and buns and makes clean up a snap! – Revolutionary proprietary heating system features heavy duty submersible stainless steel heating element. – Low water warning indicator light and illuminated ON/ OFF switch. Element will automatically switch off when water level is too low. – 7.5litre water pan for increased holding times. – Quick to open water release valve eliminates burned fingers and spilled water. – Divided food trays accommodate both hotdogs and/or sausages to be cooked and merchandised simultaneously. – Small footprint. Cook and serve hot dogs in as little as 35cm of counter space. PLEASE NOTE: Hot Dog Machine is for pick up only (WALLAN location) or FREE delivery when hiring a jumping castle. Sausages and Buns are not supplied. Price: Overnight Hot Dog Machine hire at $75.